Hand-foot-and-mouth (HFM) disease is a viral syndrome with a distinct exanthem-enanthem. 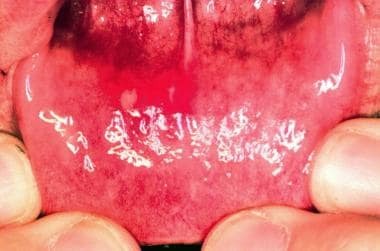 This clearly recognizable syndrome is characterized by vesicular lesions on the mouth and an exanthem on the hands and feet (and buttocks) in association with fever. See the images below. The tongue has an ulcer with an erythematous halo. A typical cutaneous lesion has an elliptical vesicle surrounded by an erythematous halo. The long axis of the lesion is oriented along the skin lines. Hand-foot-and-mouth disease is caused by a group of RNA viruses called enteroviruses. The most commonly implicated enterovirus is coxsackievirus A16. However, coxsackieviruses A5, A9, A10, A16, B1, and B3; human enterovirus 71 (HEV71); as well as herpes simplex viruses (HSV) can cause the illness. Distribution of this disease is worldwide, with a peak incidence in the summer and fall in temperate climates and with no seasonal pattern in the tropics. This illness has, essentially, a full recovery rate. However, HEV71 has been recently implicated in several large outbreaks in the Far East with severe complications and deaths. Complications are rare, but as with any pruritic rash, a secondary skin infection may occur. Severe complications may occur when CNS or cardiopulmonary involvement is present. These sequelae include dysphagia, limb weakness, cardiopulmonary failure, and even death. Although death is very rare, it is most often due to pulmonary hemorrhage or edema. Males and females are affected with equal frequency. Males are more likely to become symptomatically ill.
Hand-foot-and-mouth disease, as well as severe disease complications, are more common among infants and children younger than 5 years. Suzuki Y, Taya K, Nakashima K, et al. 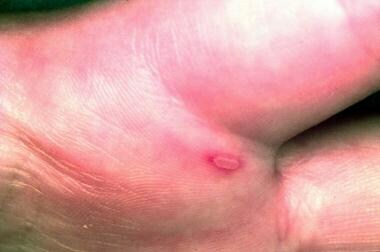 Study on Risk Factors for Severe Hand-foot-and-mouth Disease. Pediatr Int. 2009 Aug 3. [Medline]. Wolff K, Johnson RA, Suurmond D. Viral infections of skin and mucosa. Fitzpatrick's Color Atlas & Synopsis of Clinical Dermatology. 5th ed. New York, NY: McGraw-Hill; 2005. 790-92. Xing W, Liao Q, Viboud C, Zhang J, Sun J, Wu JT, et al. Hand, foot, and mouth disease in China, 2008-12: an epidemiological study. Lancet Infect Dis. 2014 Apr. 14(4):308-18. [Medline]. [Full Text]. Wang SM, Lei HY, Liu CC. Cytokine immunopathogenesis of enterovirus 71 brain stem encephalitis. Clin Dev Immunol. 2012. 2012:876241. [Medline]. [Full Text]. Lott JP, Liu K, Landry ML, Nix WA, Oberste MS, Bolognia J, et al. Atypical hand-foot-and-mouth disease associated with coxsackievirus A6 infection. J Am Acad Dermatol. 2013 Nov. 69(5):736-41. [Medline]. Nassef C, Ziemer C, Morrell DS. Hand-foot-and-mouth disease: a new look at a classic viral rash. Curr Opin Pediatr. 2015 Aug. 27 (4):486-91. [Medline]. Kuehnel NA, Thach S, Thomas DG. Onychomadesis as a Late Complication of Hand-Foot-Mouth Disease: A Case Series Shedding Light on Nail Shedding. Pediatr Emerg Care. 2017 Nov. 33 (11):e122-e123. [Medline]. Hopper SM, McCarthy M, Tancharoen C, Lee KJ, Davidson A, Babl FE. Topical Lidocaine to Improve Oral Intake in Children With Painful Infectious Mouth Ulcers: A Blinded, Randomized, Placebo-Controlled Trial. Ann Emerg Med. 2013 Nov 7. [Medline]. Chang LY, Tsao KC, Hsia SH, et al. Transmission and clinical features of enterovirus 71 infections in household contacts in Taiwan. JAMA. 2004 Jan 14. 291(2):222-7. [Medline]. Cherry JD. Enteroviruses: polioviruses, coxsackieviruses, echoviruses and enteroviruses. Textbook of Pediatric Infectious Diseases. 5th ed. 2005. 2007. Davis H, Karasic R. Pediatric infectious disease. Atlas of Pediatric Physical Diagnosis. 3rd ed. 1997. 347-8. Sasidharan CK, Sugathan P, Agarwal R, et al. Hand-foot-and-mouth disease in Calicut. Indian J Pediatr. 2005 Jan. 72(1):17-21. [Medline]. Wang CY, Li Lu F, Wu MH, et al. Fatal coxsackievirus A16 infection. Pediatr Infect Dis J. 2004 Mar. 23(3):275-6. [Medline]. Jones E, Pillay TD, Liu F, Luo L, Bazo-Alvarez JC, Yuan C, et al. Outcomes following severe hand foot and mouth disease: A systematic review and meta-analysis. Eur J Paediatr Neurol. 2018 Sep. 22 (5):763-773. [Medline]. Zhao Y, Zhang H, Liu H, Zhang J, He L, Sun H, et al. Molecular characteristics of hand, foot, and mouth disease for hospitalized pediatric patients in Yunnan, China. Medicine (Baltimore). 2018 Aug. 97 (31):e11610. [Medline].